And though pastor Begley refrained this week from confirming the world will indeed perish in hellfire on January 22, he suggested this is a possible outcome of the Blood Moon. Speaking to an online audience during one of his impassioned sermons, the firebrand preacher warned a cataclysm is headed towards the Earth. He said: “Obviously these apocalyptic signs in the heavens are pointing to a catastrophic event on the horizon. “We don’t know when. Just because you’re ogling to have a Super Blood Moon on January 20 and January 21 doesn’t mean on January 22 all hell’s going to break loose. “And then again it doesn’t mean it won’t, ok? So there are these signs that are starting to be revealed. The preacher said things are already getting “bad” and “difficult” and are only bound to get worse before the end arrives. But he also said true believers have nothing to fear from the apocalypse because they have been forewarned by the Bible. The souls of believers will be pulled off the Earth before the final destruction ensues. According to the Blood Moon prophecy, the apocalyptic lunar sign was foretold by the Book of Revelation, Book of Acts and Book of Joel. The Book of Revelation 6:12 reads: “I watched as he opened the sixth seal. There was a great earthquake. And the Book of Acts and Book of Joel both mention the Moon turning to blood before the “great and terrible day of the Lord”. Pastor Begley believes these passages in holy scripture paired with the Blood Moon, recent earthquakes, solar winds and the current state of world politics are all evidence of impending doom. 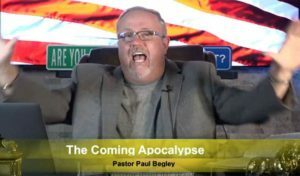 But this is not the first time Pastor Begley has warned of the world ending and the prophecy itself flares up on the internet every few months. into happens because Blood Moons are a perfectly natural phenomenon which occur once or twice a year during a total lunar eclipse . During the last Blood Moon on July 27, 2018, Pastor Begley preached the “Devil’s back is breaking” and prophecy is being fulfilled. Before that, the Blood Moon prophecy was popularised online as early as 2014 when conspiracists claimed to have found a prophetic connection between four lunar eclipses between April 2014 and September 2015. A Blood Moon is the result of natural processes, caused by scattered sunlight filtering out bands of blue light in Earth’s dusty atmosphere. The effect is known as Rayleigh Scattering and is responsible for the orange colour of sunsets and the blue colour of the skies. Space agency NASA explained: “As the Moon passes into the central part of the Earth’s shadow, called the umbra, it darkens dramatically. “Once it’s entirely within the umbra the Moon appears a dim red due to sunlight scattered through the Earth’s atmosphere.